Has your cooking gotten cra-a-a-azy yet? If not, you clearly haven't picked up Munchkin Crazy Cooks from Barnes & Noble (or ordered it from their website). For those of you who have, or for those of you who really like our promos, we're happy to let you know that we've started putting a new bookmark into all Warehouse 23 orders: The Official Munchkin Crazy Cooks Bookmark of Dinner Distraction! This bookmark lets you ditch your food tokens for bonuses to Run Away from a nasty, scary, hopefully hungry monster. "What are food tokens?" I hear some of you say. 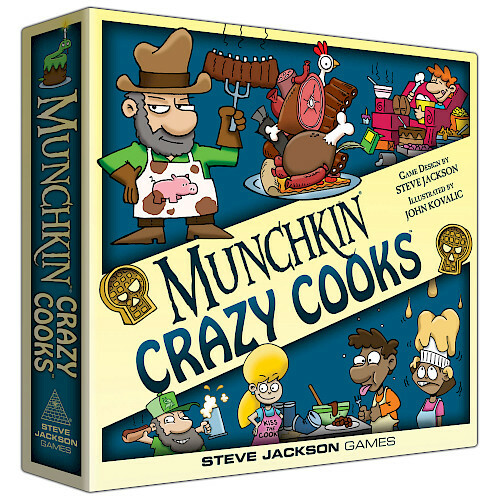 Pick up Munchkin Crazy Cooks and find out!